There is something universal about popcorn. I don’t think I’ve met anyone who doesn’t like it in some form. Maybe it gets the star treatment from being a first I-can-cook-it-all-by-myself food for many kids. Popcorn is like a good pair of jeans: you can wear it plain or dress it up and it is still a winner. This popcorn is dressed up and ready for a night on the town. Well actually it is probably best eaten on a night in watching a good movie with the family. Warning: you’re going to get messy (and you won’t care!). Not only is this a delicious recipe but you are going to love me for this next tip. Okay, maybe you won’t think this is as cool as I did but I was pretty excited about it. Did you know that you can get microwave popcorn without all of the mystery ingredients? That’s it! Put your kernels in the bag, fold over the top a few times and pop away! I found that 60 seconds worked in my microwave for about 1/3 cup of popcorn. You may have to play around with yours as microwaves vary. Pop popcorn according to directions. You are going to want to be sure to get ALL of the unpopped kernels out. I use a 2-bowl method. You’ll need 2 large bowls. Dump the popcorn into bowl #1. Give it a little shake and let the unpopped kernels fall to the bottom. Using your hands transfer the popcorn to bowl #2. This is best done in small batches. I usually complete one bag while the next bag is popping in the microwave. In a large saucepan combine butter, brown sugar, and light corn syrup until melted and comes to a boil. Reduce to low/medium heat and add the sweetened condensed milk. Stir continuously for about 5 minutes. The longer you stir the firmer your caramel will be. Pour caramel over the popcorn and stir until incorporated. You will feel like it is not working at first but keep at it and the caramel will coat the popcorn. Some great add-ins would be nuts, M&Ms, pretzel pieces, or chocolate chips. I want some. Right now. I love my jeans and I love my popcorn. This sounds like a night on the town for the humble kernel. Delicious! Soft caramel popcorn is the only way to go. It’s been a while since I’ve brought out my popper…my kids would love me if I could pull it off tonight since I they would never expect it. What a great method! Can’t wait to pop this! Have a wonderful weekend! I definite fall for the savoury popcorn more than the sweet, but this does look wonderful! (It’s Carolyn, BTW, having issues logging in to Blogger). This looks amazing Katrina! I am all about sweet popcorn but nothing is worse than the hard stuff! Beautiful pictures too! Thanks for sharing! Thanks for cracking the code for microwave popcorn. I’m trying to avoid that stuff because it stinks the microwave. 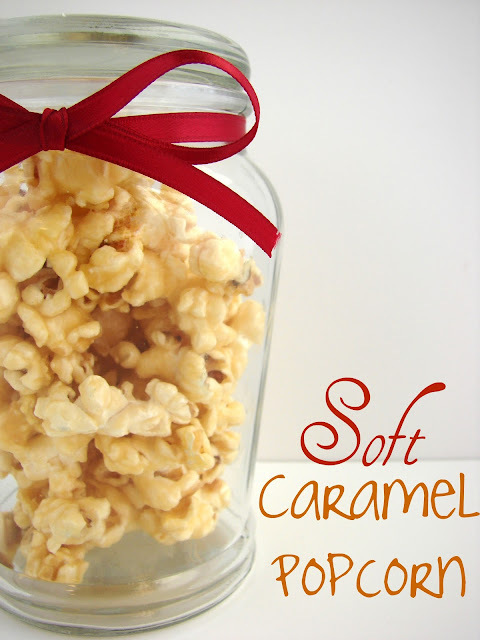 Love recipe for caramel popcorn. Oh my! I have been living under a rock. I did not know you could make your own popcorn that way. I am definitely going to do that. The popcorn looks so beautiful in the jar with a bow 🙂 Have a wonderful weekend! I don’t think I’d be able to put this down! I have been doing the brown paper lunch bag popcorn for years now… everyone always looks at me as if I’m crazy when I tell them about it! I’m so glad you shared this!! And I just LOOOOOVE caramel popcorn!! Who doesn’t?!? Who knew?! No idea you could do that with popcorn – Thanks! And this caramel popcorn, wow! Been a long time since I have had it, especially home made stuff – YEARS! Might have to change that this weekend! Thanks! This sounds so yummy. I’ve got to try out this caramel coating too. 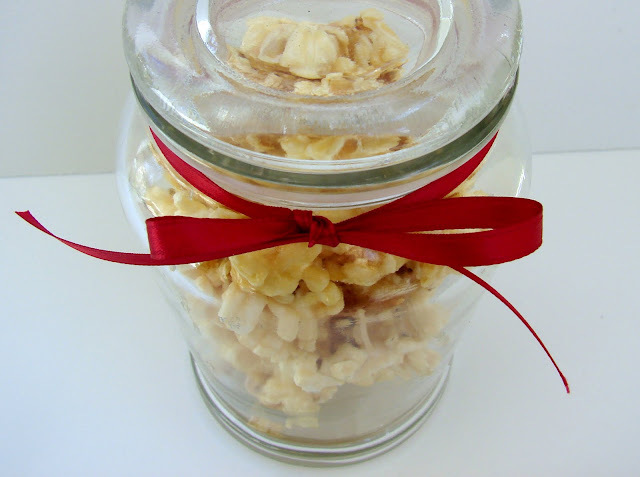 Your jar there looks like real gourmet popcorn. Have a great weekend! Yum, Katrina…this looks so good! I’ve had caramel popcorn, but never soft caramel. I’ll bet this is downright addictive!! I think the kids would be eating this popcorn BEFORE I ever got the first bite. Yes it looks that delicious!! That sounds like some good stuff right there! Love sweetened condensed milk. 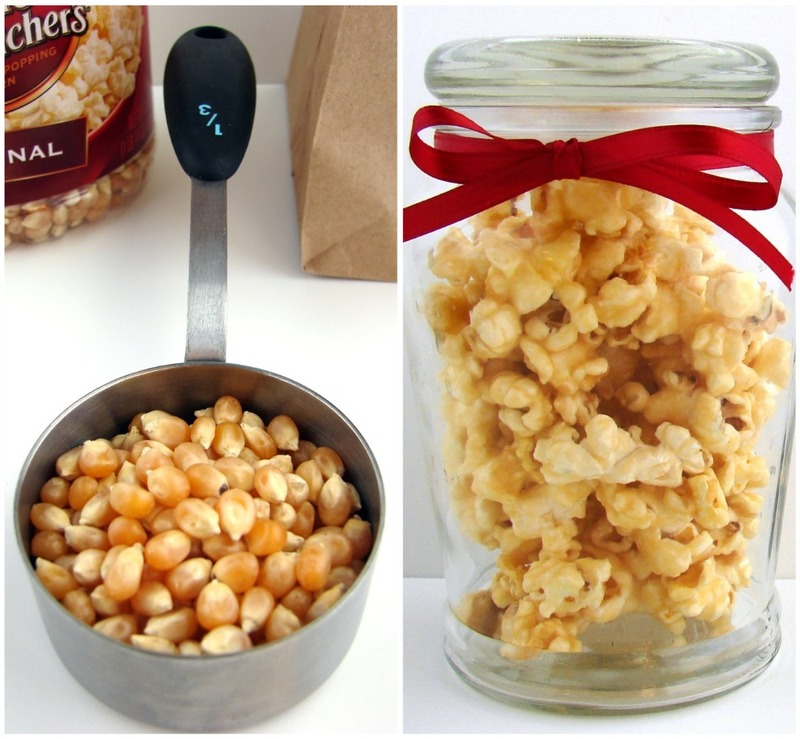 I love this kind of caramel corn-soft(unbaked)! Sounds delicious! I would have to follow your advice and do a few add-ins like the choc. chips and maybe a few peanuts. Tasty recipe and ideas! I am not fan of pop corn, before i went to the US i hated it… but when i tasted it with butter!! Gosh i went crazy! Now i enjoy it sometimes when i go to the movies, but pop corn like in the US… a delight! I think I have just died and gone to popcorn heaven…seriously Ms. Katrina this is like the find of the week for me! I love popcorn, my air popper just STB (my own naughty acronym 🙂 and I’ve got tons of brown lunch bags and a huge bag of popcorn that I thought would be sitting on the shelf. Side note…I was so bummed when my air popper died because I make a batch or two a week and toss it in the yard for my chickens…lol! Oh yum. I want to dive into that jar of caramel corn. It looks so amazing. I love this. Many thanks! Caramel corn is a favorite in our home 🙂 Thank you for sharing! I love popcorn! It’s so dangerously addictive. This looks fantastic. Yum. I love caramel corn. Here in Chicago, the “Chicago Blend” at the popcorn shops is actually caramel corn mixed with cheese popcorn. I know, it sounds weird, but it’s so good! I’m not a big fan of popcorn. But I guess its the best you can do with corn. I surely liked the 6th instruction, Katrina!haha..Seriously,I love popcorn and this is a great alternative to the regular one I usually have! Hugs! I am seriously addicted to carmel corn… it’s a problem. Often I find myself falling asleep with a bag next to me in bed, making it at home is going to be delightfully dangerous! I love popcorn in all it’s many forms and this looks fabulous. 🙂 I totally must try this brown bag popping method. I just bookmarked this recipe. I’m totally making this next time I make popcorn. LOVE IT! Oops I added all the ingredients at once should i start over or will it work? Holy cow. I only added half the corn syrup and 3/4 cup brown sugar and that is probably the sweetest caramel corn I’ve ever had. I love the idea, but it definitely needs some salty add ins or something to tone it down. I tried it and this stuff is pretty dang good! It’s so soft!